Birdscaping - professional installation & maintenance of bird feeders for your enjoyment at home or work. Welcome to the Birds of the Byway! I hope this site will enhance your experience and enjoyment of the locations and birds that can be found throughout the year along the Birds of the Byway. 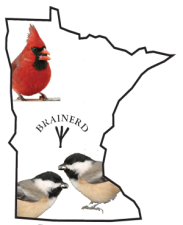 The North Central area of Minnesota, including the Brainerd Lakes area, has one of the highest counts of breeding birds in the country. Excellent birding opportunities are available year round at many locations along the Birds of the Byway. The Mississippi River is used by many birds each spring and fall as one of the major migration flyways. Over 100 species can be recorded in a single day at the many birding locations found along the Birds of the Byway. The diverse habitats found here include streams, wetlands, lakes, rivers and forests. I hope you enjoy your stay and take a tour of the Birds of the Byway. I encourage you to use the maps and other information provided here to help you explore the area. I can be contacted for bird watching tours for individuals/groups, resort guiding packages or naturalist programs for families on the Birds of the Byway. The spring migration starts in March/April with ducks, geese, swans and cranes. The peak occurs during the month of May with many neotropical birds arriving in the area and the last arrivals in June. Some of the better bird watching locations early in the spring are near water, especially rivers as they tend to open up first. As the migration continues, a visit to wooded areas can produce warblers, flycatchers, vireos and thrushes. The fall migration starts in August with many warblers and shorebirds gathering in small to large groups. The peak occurs in September for most species, including the area's songbirds. Most of the birds are gone by the end of November, but Eagles can still be seen occasionally. The area is home to many breeding birds such as Bald Eagles, Osprey and Common Loons. Many other species, such as Scarlet Tanagers and Golden–winged Warblers can be found in certain habitats as well as Ruffed Grouse and American Woodcock. Winter Birding along the Byway is both challenging and rewarding for those who dare to venture out in the cold. It is a good time to find uncommon or rare birds that winter in the area such as Owls, Woodpeckers, Waxwings, Grosbeaks, Redpolls and Finches. Not all of these are present at the same time, but in most years a good variety of them can be found. Some of the better locations include bird feeding stations, fruiting trees and large stands of pine or spruce. A new Christmas Bird Count, the Uppgaard WMA CBC took place on December 16, 2011! This count is a great way to get people involved for documenting population changes and bird diversity. You can participate by counting birds from home or bird with a small group along an established route. The data will be posted here at Birdsofthebyway.com under CBC. This area hosts 8 of the 10 most wanted birds in the country! The best way to increase your chances of seeing one of these species, and many others along the Birds of the Byway, is to contact a guide who knows the area and best locations to look. For more information about birding along the byway with a guide please see the guide service tab.